Belize City, Belize – February 10, 2016 – The Belize Tourism Board (BTB), through its community based initiatives and responding to its stake holder needs, in this case the Caye Caulker Village Council and tourism stakeholders, embarked on a strategy to improve the public beaches of Caye Caulker. 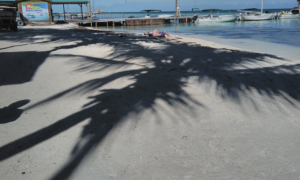 As a result, an “Action Plan for Sustainable Tourism Development of Caye Caulker” was completed in September 2015 and identified beaches as one of the development objectives of infrastructure improvement. 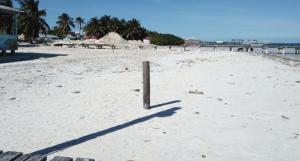 This enhancement project fits the product development objectives laid out in the National Sustainable Tourism Master Plan (NSTMP) 2010. 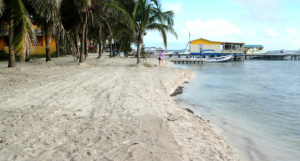 A total of 1,883 linear feet of the beach was reclaimed and had widths varying from 70 to 118 feet in areas between Sobre las Olas to Rainbow Restaurant, and widths varying from 40 to 60 feet in areas between Blue Island pier to Len’s Guest House. Approximately 22,000 cubic yards of material were pumped for the completion of works.